Someone needs to explain to me why I should want to spend time with an obnoxiously narcissistic chef who’s trying to make a comeback in London after having undermined a skyrocketing career in Paris. But wait, maybe the answer has something to do with the fact that said chef is the main character in a movie called Burnt, and he’s played by a fashionably bestubbled Bradley Cooper. 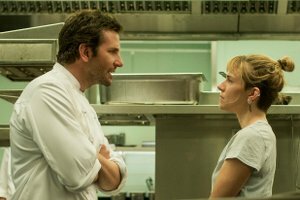 Burnt, the plot of which I’ve just described, can’t rise above its many problems even with Cooper portraying a culinary hotshot who thinks he’s better than everyone else — and probably would be if it weren’t for the drug and alcohol problems that derailed his rise. Turns out the best thing about this John Wells directed movie, set in the upper echelons of London’s foodie culture, is the food, photographed with glossy slickness by cinematographer Adrinao Goldman. When the camera focuses on the meals that Cooper’s Adam Jones prepares, the movie has the allure of a beautifully photographed gourmet magazine, and it affords us a glimpse into the kitchens of the kind of gastronomically praised establishments that serve up minuscule portions for astronomical prices. Is there an unwritten rule that all highly praised food must never touch the edge of any plate? Wells supplies the kitchen scenes with the heat and bustle you’d expect, and I’d have been content if food preparation — complete with tension, yelling and the occasional dress-down — had completely wiped out the plot. The screenplay by Steven Knight (Locke, Redemption) doesn’t have much to offer once it convinces us that Jones’ character is a jerk. Because he’s a talented jerk, others — Sienna Miller as a saucier with a big future and Daniel Bruhl as a gay Maitre-D — tolerate Jones and try to help him, even when they’re frustrated by him. Additional support comes from Omar Sy (The Untouchables), as a sous chef whose business in Paris was ruined by the then drunken Jones, and Matthew Rhys , as a rival restaurateur who also dislikes Jones intensely. Subplots involving Jones’ indebtedness to drug dealers and the late-picture introduction of one of his former lovers (Alicia Vikander) add little to an undernourished script. Functioning as a kind of garnish, Emma Thompson appears as a doctor hired by Jones’ employer to monitor his blood-alcohol level, and, occasionally, to offer sage advice. Celebrity chefs Marcus Wareing and Mario Batali are credited with having served as consultants on the movie, so the kitchen environment presumably has some authenticity. Truth be told, I’d rather watch the two of them work than be force fed another helping of Burnt. If you’re hungry for a more appetizing food movie, and haven’t seen Chef, well ... there’s always Netflix.